Background: Designing a novel antagonist against VEGFR-2 is being applied currently to inhibit cancer growth and metastasis. Because of the unexpected side effects incurred by the contemporary anticancer medications, the focus has been laid towards identifying natural compounds that might carry the potential to inhibit tumor progression. VEGR-2 remains an important target for anticancer drug development as it is the master regulator of vascular growth. Objective: The study focuses on virtual screening of compounds from plants of Asteraceae family that bears antiangiogenic potential and thus, inhibiting VEGFR-2 using a computational approach. Materials and Methods: Structures of phytochemicals were prepared using ChemDraw Ultra 10 software and converted into its 3D PDB structure and minimized using Discovery Studio client 2.5. The target protein, VEGFR-2 was retrieved from RCSB PDB. Lipinski’s rule and ADMET toxicity profiling were carried out on the phytochemicals of the Asteraceae family and the filtered compounds were further promoted for molecular docking and MD simulation analysis. The study extends towards the SOM analysis of Pinocembrin to predict the possible toxic and non-toxic in vivo metabolites via in silico tools (Xenosite Web and PASS online server). Results: The docking results revealed promising inhibitory potential of Pinocembrin against VEGFR-2 with binding energy of -8.50 kcal/mole as compared to its known inhibitors Sorafenib and YLT192 having binding energy of -6.49 kcal/mole and -8.02 kcal/mol respectively. Further, molecular dynamics (MD) simulations for 10ns were conducted for optimization, flexibility prediction, and determination of folded VEGFR-2 stability. The Hsp90-Pinocembrin complex was found to be quite stable with RMSD value of 0.2nm. Pinocembrin was found to be metabolically stable undergoing phase I metabolism with non-toxic metabolites compared to the standard drug Sorafenib and YLT192. Conclusion: Obtained results propose Pinocembrin as a multi-targeted novel lead compound that bears outstanding antiangiogenic potential against VEGFR-2. 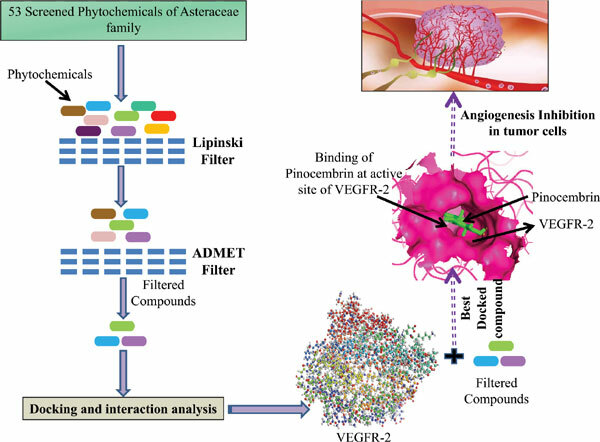 Angiogenesis, VEGFR-2, Pinocembrin, molecular dynamics, metabolism, metastasis.